While Amazon already started taking pre-orders for its brand new Fire smartphone, we still have to wait more than a month before the device starts shipping. Until that happens, if you’re wondering just how many Fire phones might be shipped before the end of 2014, we may have the answer. According to DigiTimes, sources from “Taiwan's handset supply chain” expect Amazon to ship 2 to 3 million smartphones this year. The Fire phone is manufactured for Amazon by Taiwan’s Foxconn, which, for now, reportedly makes 300,000 to 500,000 units per month. 2 or 3 million Amazon Fire phones shipped this year may not be much in the grand scheme of things, but it’s a lot if we think about the fact that the handset is exclusively available at AT&T (starting at $199.99 on contract). The Fire phone isn’t exactly a high-end device, as it doesn’t have a high-resolution display, and neither a new-generation processor. But it offers a few things that no other handset has, including a dynamic perspective 3D interface, and Firefly (Amazon’s new service that recognizes and lets you buy about 100 million different items). Is that enough to make the Fire phone a game changer? Only time will tell. Not only because it's locked to the Amazon ecosystem, and the phone itself isn't that great in terms of design, but also the fact that it's exclusive to AT&T. If it were also available on Verizon, T-Mobile, and Sprint, then I could easily see it selling 3 million units and more people sticking to it. Carrier exclusivity is a way of saying "we're not sure if this is going to take off, so we'll just design it for one carrier". I disagree about this device not being high end based on the reasons you pointed out. If it's the screen resolution then why is the IPhone 5s still considered high end when it's screen is even smaller and it's PPI isn't that much higher than the fire phone's. As for the chip processor, the snapdragon 800 came out 8-9 months ago (about as old as the A7 chip of the iPhone 5s); if that's a reason then I suppose the Samsung Galaxy Note 3 and Nexus 5 are not high end either as they sport the same chip processor as the Fire phone? Well for the last reason (SoC) that's obviously because those phones you mention were released last year... Granted there is hardly a difference between the two, but it still stands that Amazon should have at least gone for the updated S800 (S801). As for the iPhone's display, well, it's the only smartphone with iOS so it's "high-end" for what it is. It's stupid logic but true. As you said, the 801 isn't a vast improvement over the 800. On many tech sites people referred the Nokia Lumia 930 as a high end device and that phone will also sport the snapdragon 800 chip when it's released in Europe this July. I agree with your point. The Fire Phone may not quite match the specs of current Android flagships but it isn't off by much. That being said, I still think that they priced this device incredibly poorly. Considering that it's more or less just a portal to buying Amazon content, they really should have gone for the discount up front since they'll be making the money on the back end. And based on the new test done on the S5 LTE-A which has the 805 chip (it's one of the new articles here on phonearena )it seems that chip isn't much of an improvement either. It received a 37,000 benchmark score while the Note 3 which has the 800 chip had a score of 35,000. So I think it reinforces my complaint about not calling the Fire phone high end simply because it has the SD800 chip. "about as old as the A7 chip of the iPhone 5s" They may have been released at similar times, but a major difference not mentioned is that the A7 is 64-bit chip so it's much more future proof than what the Kindle Fire Phone has. Oh cut that crap... I have seen the iphone lag with "desktop class 64bit" chipset. the iphone 5s doesn't lag....the animations in ios 7 are designed in that way....but there is a setting to disable those animations if you don't like them. i am not saying that kindle fire phone is not future proof, its a good phone but we still don't know how many months or years amazon will support it...that would depend on the sales. because although apple were competing with android, it's not direct orange to orange or apple to apple. whereas in fire, it is directly competing with other android vendor. and what amazon got on fire is just a hype/gimmick. For those who saying its not full hd display and its pricey, please stop this is a unique innovative smartphone and not the run of the mill specd. phone. i agree with you....if they want better specs, they have many options in the market. but some of the features available in the amazon fire phone aren't available in any other phone in the market today, if it comes with the same specs and features like the other flagship android phones, then it would serve no purpose. Amazon is currently in talks with European carriers to see which one will be carrying their smartphone. http://seekingalpha.com/news/1805493-amazon-in-talks-with-european-carriers-over-smartphone?uprof=45 It will start out as a U.S. exclusive handset, but will launch internationally in the near future. I think the this phone has a chance to sell 2-3 MILLION this year. 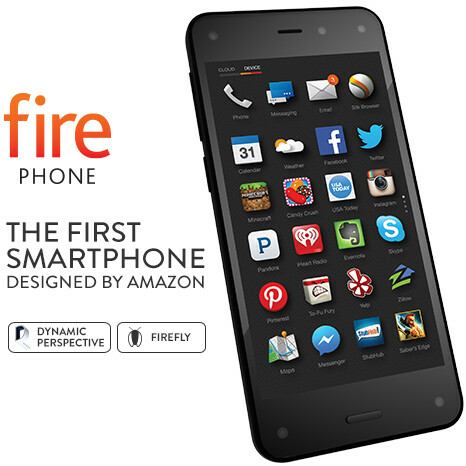 Amazon has GREAT marketing, a large ecosystem and TONS of cash to put behind this handset. I think this is a good handset with unique features which can be used as selling points. So, how many of these do you think are actually going to be SOLD, and the returned when the user realuzes what an awful phone it is? just as much as current bb z10 number or microsoft kin number. NOW you're trolling articles on AMAZON?! Trolls like you never rest, do they. I don't think any will be returned, nor do I think the phone will be "awful". How can anyone say how bad this phone is going to be if absolutely no one has used it yet? Doesn't make sense. This phone has unique features that can be used as selling points, and has a great ecosystem to go along with it. It's also made by a company that has GREAT marketing and lots of cash to back it. Early buyers of this phone will most likely be those already entrenched in Amazon's ecosystem, like me. The only drawbacks to this handset are the AT&T exclusivity in the U.S. and the price.